My parents live in a house on a big hill on the edge of the woods. Even the landscaped sections are wooded — meaning not only is it difficult to grow anything that won’t do well in shade or, in some instances, among shallow tree roots, or that every inch is fodder for roving herds of deer, no matter how “deer-resistant” a plant may be, but that weeds grow — everywhere. Tiny beginnings of new forest, trying to take back the ground and the air. Growing up, I spent countless afternoons with my mom, batting off mosquitoes and pulling buckets and buckets (and buckets) of weeds to carry up the hill and dump into the woods. Especially irritating, and smelly, were the wild onions that grew in the mulch alongside the driveway. They were plentiful and pesky — their roots didn’t lift easily, and I ended up tearing more than I pulled. I hated them. Until a few weeks ago. I think it may have been all the excitement over ramps, garlic scapes, and young spring onions — things farmers probably harvest from wild patches outside their homes, rather than on tilled land, and that we city-dwellers devour because, no matter how weird (fiddleheads? really? ), they take us from our concrete canyons and bring us back to the land. But when I went home for a weekend recently, we started talking about growing things like kirbies, tomatoes, and herbs, and my mom jokingly mentioned that I could have the wild onions growing in the front. Eureka! Why on earth hadn’t I thought of that before? I walked down the length of the driveway to investigate, pulled up a couple, smelled them, and realized that yes, these are things one eats — they’re not just weeds; they’re food. I picked as many as I could without tearing them (okay, I tore a lot. I still do that), packed them in a bag, and hauled their intoxicating oniony-garlicky aroma on a NJ Transit train full of people back into the city. 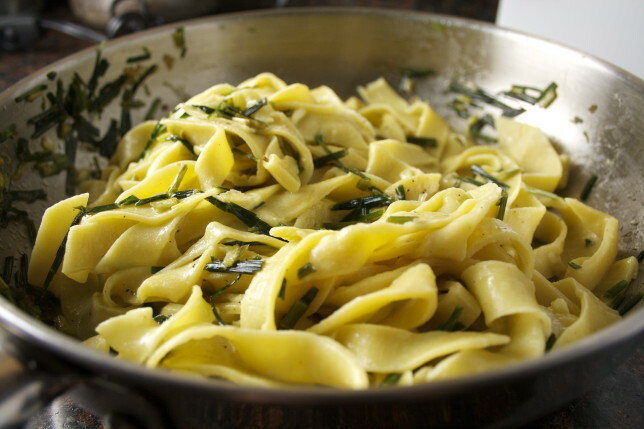 The next day I took David Lebovitz’s advice and paired them with fresh pasta. Another mom-tale: she got a hand-cranked pasta machine for me at a neighbor’s yard sale years ago, and I never took it. Eventually, she got sick of it taking up space in her cupboard and tossed it. I’m very ashamed of younger me. Why didn’t I realize that one day I would actually want to make pretty much every single thing I ate from scratch? Fear not though, self, and most of you others out there who don’t have a pasta machine. You can make it by hand. It requires a few more egg yolks to make the dough pliable enough to roll thin enough for noodles, but it’s simple, and it’s worth it. 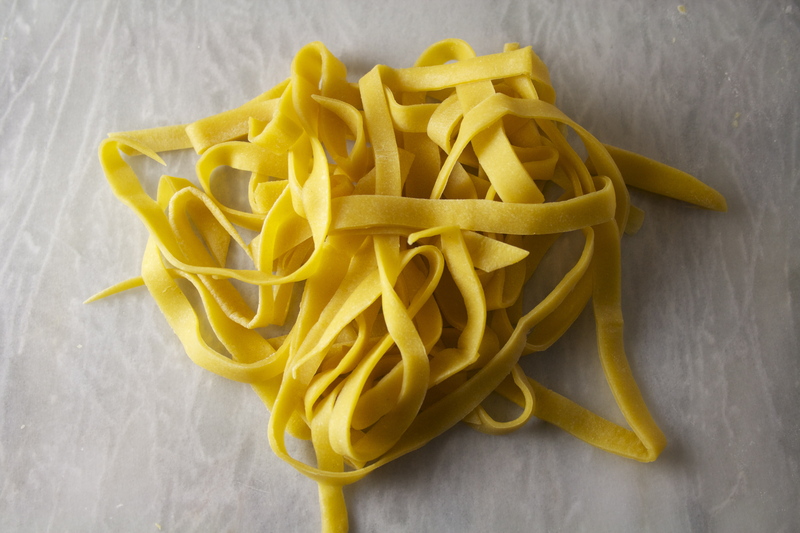 Flour, eggs, and a bit of olive oil are combined in a food processor, kneaded by hand, and left to rest before being divided, rolled, dried ever so slightly, and cut into ribbons. Cooked in salted, boiling water for three minutes and tossed in the sauce of your choice — in this case, wild onions and butter — and you’re done. 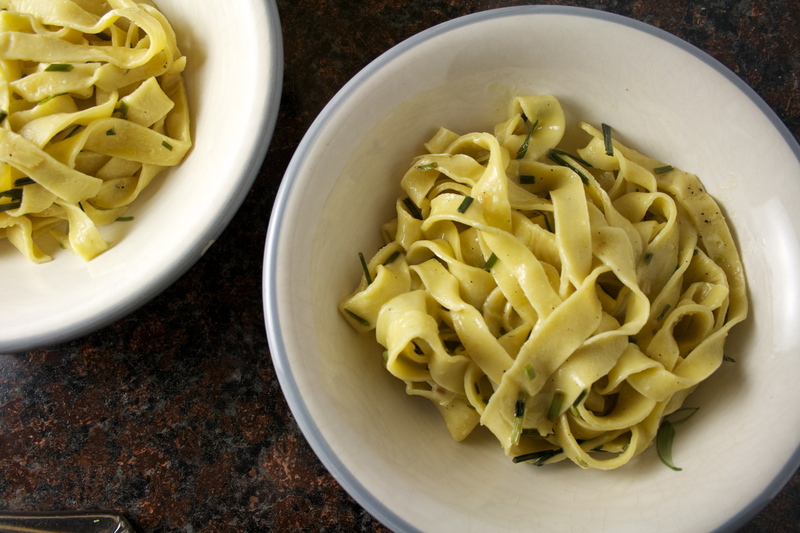 Of course it’s not as easy as boxed pasta, but it’s heartier, and, dare I say it, healthier. The addition of eggs gives you protein you wouldn’t ordinarily have from dried pasta. (Though that might just be the same as me saying that ice cream is healthy because it’s made from milk…) The texture is out of this world — springy but with a bit of bite, able to support anything from the most delicate sauce to the heaviest. 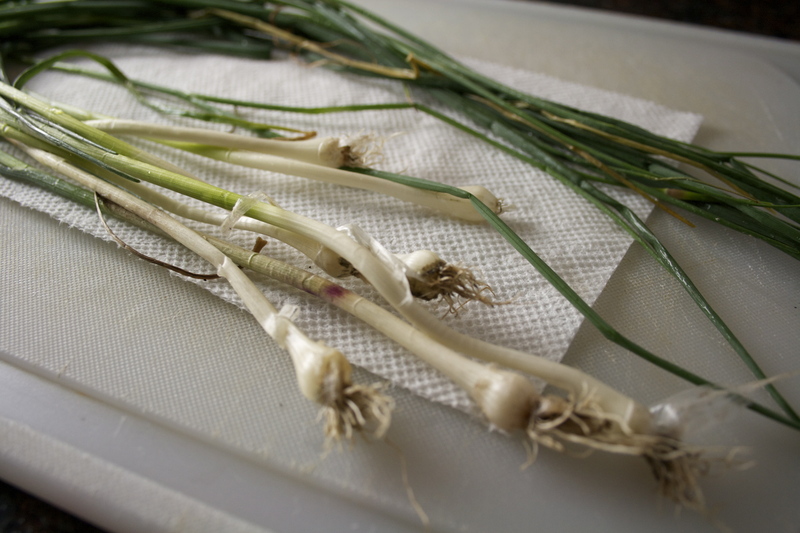 Don’t have access to wild onions? Me neither, most of the time. Use spring onions or ramps, make the aglio y olio sauce, or sauté some cherry tomatoes with garlic and olive oil, and finish with shredded basil. Really, anything easy, or delicious. It’s pasta. Pasta is the world. I’m almost hesitant to suggest that you go out in search of wild onions. If you know you have them, by all means, pull them and prepare them! But if you’re unsure, make sure you smell them. Not only will they look like smaller spring onions, they should have a very strong smell. If they don’t, they could be something else that you should definitely not eat. This handy little video may also be helpful if you’re foraging in your yard. The best way to harvest them without tearing them is to pull them, gently, after some rain, when the soil is less packed. You can dig them up, too. But again, any delicious sauce will work with the pasta. Even butter, salt, pepper, and parm. 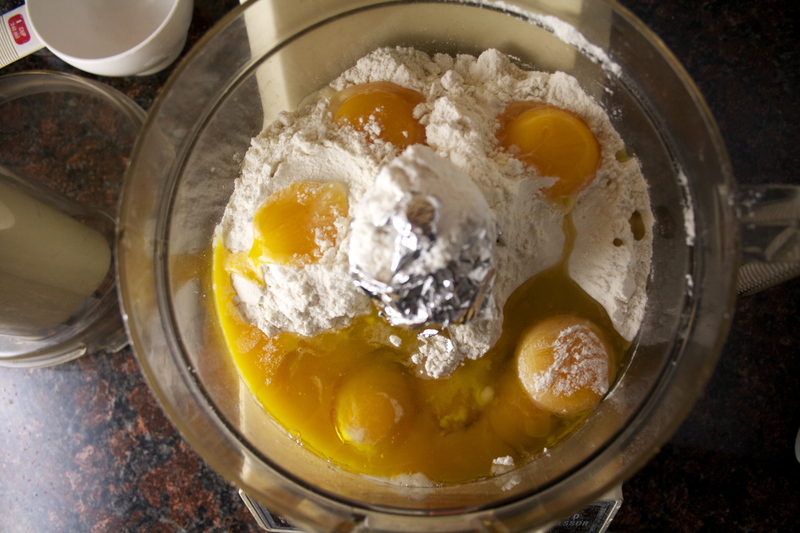 In a food processor, process flour, eggs and yolks, and oil until mixture forms a cohesive dough that feels soft and barely tacky to the touch, about 45 seconds. If the dough sticks to your fingers, add up to ¼ cup flour, 1 tablespoon at a time, until barely tacky. 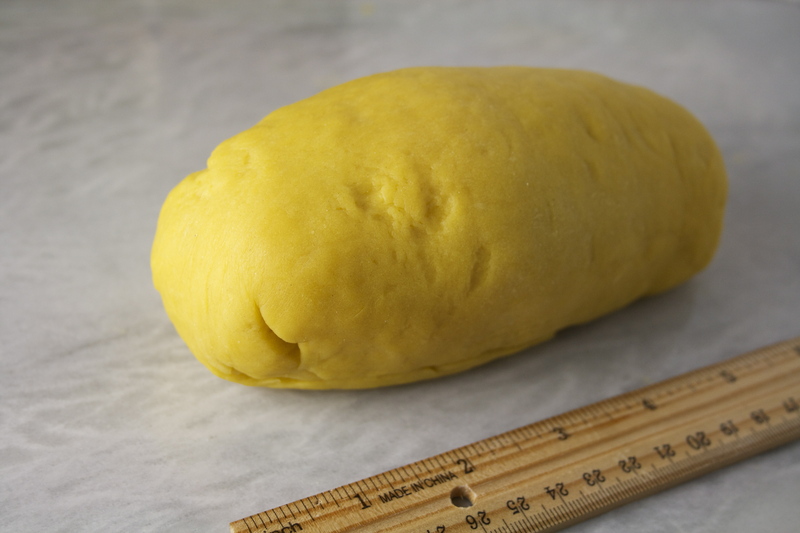 If dough doesn’t become cohesive, add up to 1 tablespoon of water, 1 teaspoon at a time, until it just comes together. Process for 30 seconds longer. Turn the dough onto a dry surface and knead until smooth, about 1-2 minutes. Shape into a 6-inch-long cylinder. Wrap in plastic wrap and set aside at room temperature to rest & hydrate for at least 1 hour and up to 4 hours. Cut cylinder crosswise into 6 equal pieces. Working with one piece of dough (keeping the others wrapped in the plastic), dust both sides lightly with flour and place cut side down on a clean work surface. Press into a 3-inch square. Using a rolling pin, roll into an even, 6-inch square. Dust both sides again very lightly with flour. Starting at the center, roll dough away from you in one motion. Return the rolling pin to center and roll it towards you in one motion. Repeat until it measures about 12 inches long. Lightly dust both sides if the dough is sticking to the counter and continue rolling until it measures about 20 inches long and 6 inches wide, lifting the dough frequently to release it from the counter. You should be able to easily see the outline of your fingers through the dough. 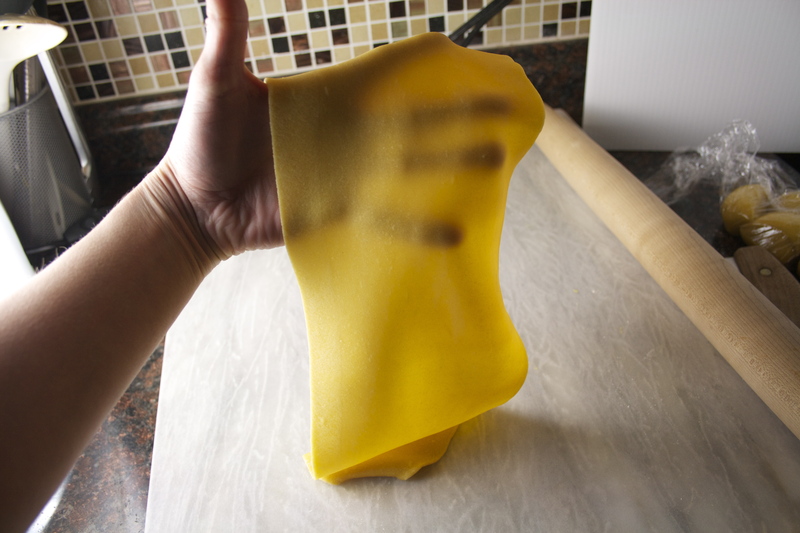 Transfer pasta sheet to a clean kitchen towel and let stand, uncovered, until firm around the edges, about 15 minutes. Meanwhile, roll out and repeat with the remaining pieces of dough. 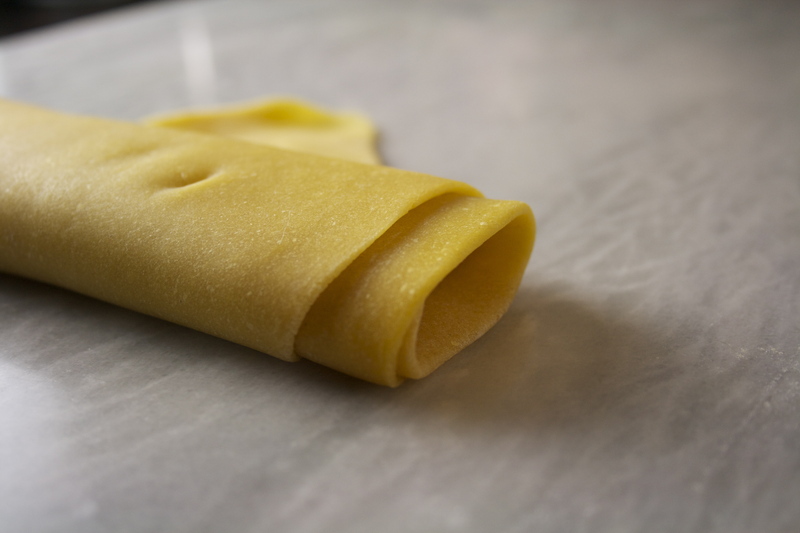 Starting with one short end, gently fold the sheet of dough at 2-inch intervals until the sheet has been folded into a flat, rectangular roll. 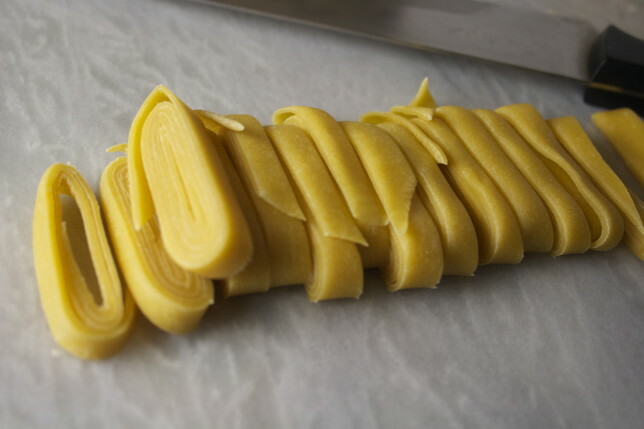 With a sharp chef’s knife, slice crosswise into 3/16-inch-thick noodles (between ⅛-inch and ¼-inch — or somewhere around any of these). Unfurl and transfer to a baking sheet. Repeat with the remaining sheets of dough. Cook within one hour or transfer the baking sheet to a freezer and store frozen noodles in a freezer bag. Bring 4 quarts of water to a boil in a large pot or dutch oven. Melt butter in a large skillet on medium-low heat. Toss in onions and cook until the pasta is ready, adding salt and pepper to taste. 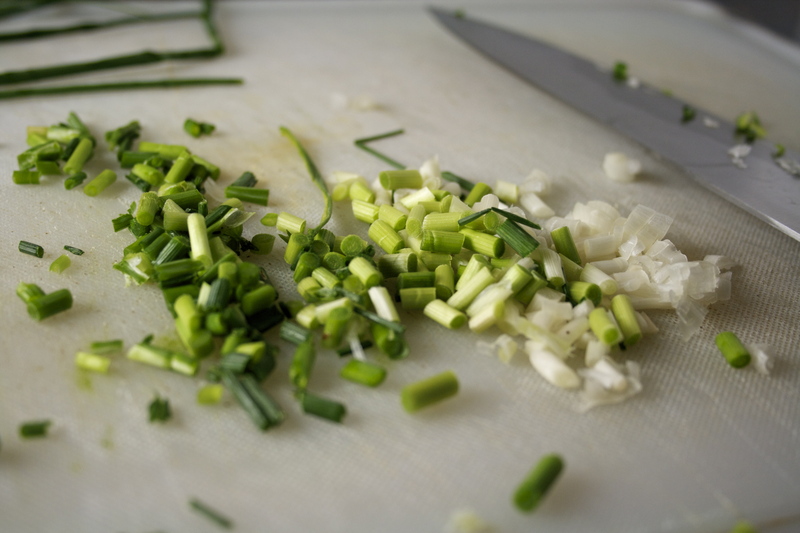 You want the onions to cook and wilt slowly, otherwise they may end up crunchy. Or follow the directions for your favorite sauce. 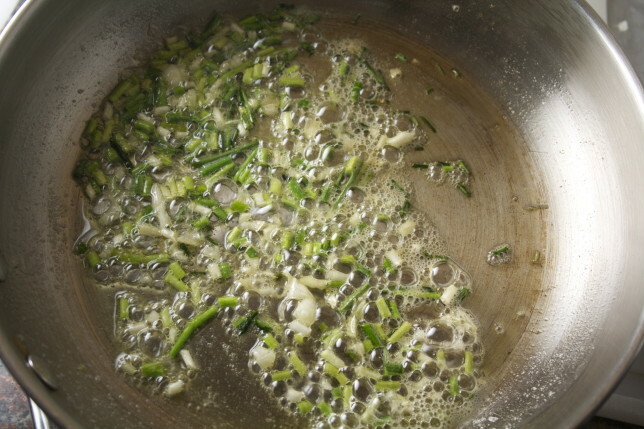 Once the water is boiling, add salt and cook pasta until tender but still al dente, about 3 minutes. Reserve 1 cup pasta water. Drain and toss with sauce, using the pasta water to loosen up the sauce if necessary. 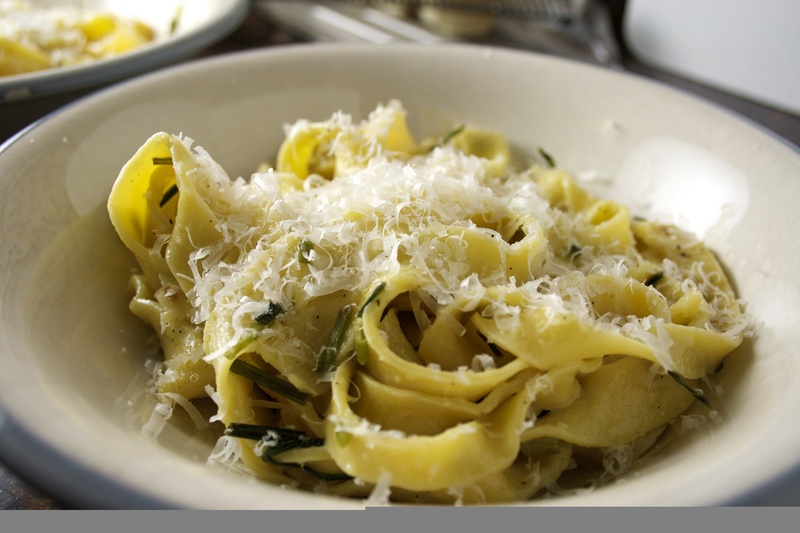 Serve with freshly grated Parmigiano-Reggiano.